Everyday clients reach out to us excited and hopeful about transforming their kitchen into the space of their dreams. The kitchen is the hub of the home. It nourishes our families. It needs to be an inspiring and comfortable space. 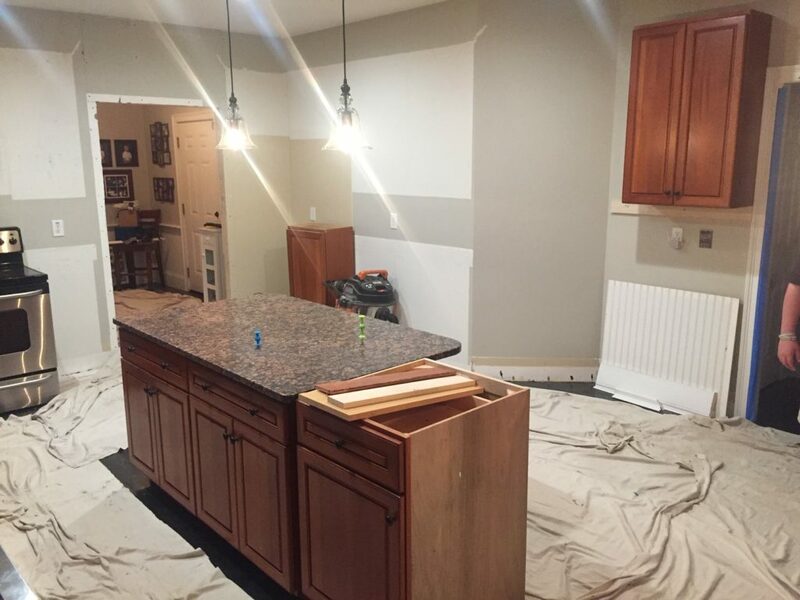 Knowing the importance of the kitchen, we get upset when a client reaches out to us deflated after hiring another painter who did not live up to expectations. One such client reached out to us desperate to get his kitchen looking decent after the paint started peeling off in sheets shortly after he had the cabinets painted by a “professional”. The painter he had hired did not properly prep the surface to allow the paint to adhere. So how do you know if the painter you are hiring for your cabinet project will get the job done well? Here are a few guidelines to follow when evaluating your painting contractors. Qualifications – Hiring a painting contractor who is licensed and fully insured is essential for a successful home improvement project—it protects you and your property. Hubley Painting is fully licensed and insured. Type of paint – Make sure to ask your painter what type of paint they will be using for the project. Some paint productions should only be sprayed in a specialized spray booth and not in a residential setting. If you are unsure about the paint being used, check with a paint representative at your local paint store. Hubley Painting knows our clients want a factory finish, so we work hard to give them a high-quality painted surface that is safe for the homeowners and our crew. We achieve this by working closely with the Benjamin Moore paint reps to select the right paint to ensure durability and longevity. The product we use is a Waterborne Alkyd, a product that is applied like a latex paint but dries like an oil-based paint. This product has fantastic leveling properties to provide a smooth and durable finish. A high-quality finish and the safety of our clients and crew are most important to us. Time on site – Ask your painting contractor how long they will be onsite. Being thorough means our crew puts in a significant amount of time in on your project. The doors and drawers are in the shop for approximately 3-4 weeks. The crew is onsite 6-8 days. There are other cabinet finishes that can be used for kitchen cabinets, but the faster drying products are hazardous and dangerous to spray inside residential settings. We opt to use a safer paint that requires our crew be onsite longer. Investment in Work – Hubley Painting is constantly looking to improve our process while maintaining a superior product. We have invested heavily into our equipment. We use dustless sanding machines on site to prevent dust from spreading throughout the house. We have a meticulous process for setting up plastic containment as another layer of protection from dust, debris and over spray. Your floors, appliances, and countertops are protected with multiple layers of plastic and paper. We also have invested in air assisted spray machines specifically meant to spray cabinetry. Our equipment allows us to provide a high quality product while protecting you and your home from dust and overspray. Check with your contractor regarding the equipment they use and the measures they put in place to protect your home. We would be happy to provide you with some references if you would like to speak to some of our former clients. Our cabinet painting services is in high-demand these days and we think that speaks volumes to the quality of our work. We understand that cost is a big part of your decision and we understand if you decide to go with the other company. We want to make sure our clients are protected from situations like the one described above. Our Wrentham clients bought their beautiful home several years ago. They loved almost everything about the home. The pool. The front porch. The space. And the neighborhood which was perfect for their family. But the kitchen left a lot to be desired. The clients wanted to make the space more functional as well as lighter and more contemporary so they called Hubley Painting and Carpentry. It is amazing the difference paint can make in a space. The kitchen is so much lighter and brighter now that the cabinets and walls have been painted. Crown molding was added to the top of the upper cabinets to give the space a more grander feeling. New doors were ordered in shaker style to update the look as well. The island saw quite a transformation. Alex, our carpenter extended it in both directions adding decorative corbels for character. The extension created a larger prep space and allowed for more seating. The island cabinets were re-purposed to house a microwave and coffee maker freeing up space on the counters. The clients wanted a farmers sink in their new space. Alex reconfigured the old cabinet base to fit the new sink. The space was measured and new doors were made to fit the new opening. The cooktop was small and dated so our clients decided to upgrade to a beautiful range. Alex made room for the larger unit by taking an upper cabinet on either side of the original stovetop and vent. The lower cabinets were also altered to fit the range. The cabinet to the left of the stove was significantly decreased in size. With the small space left, Alex created a pull out spice rack. To the right of the stove, the double door cabinet was turned into a single door cabinet and the drawer was reduced in size as well. Our tile contractor created a beautiful tile focal piece above the stove which pulls in all the colors of the kitchen so well. There were two banks of cabinetry on the opposite wall in the kitchen with a small doorway in between leading to foyer and family room. With the oven now part of the range, more space was freed up on the wall to make room for a larger refrigerator. The homeowners felt they had plenty of storage space and opted to remove the second bank of cabinets and enlarge the opening to the kitchen. The cabinet bases were re-purposed to transform this area. This area was not being used to its full potential in the old kitchen space. A few simple changes transformed the desk space into a beautiful and functional wet bar. 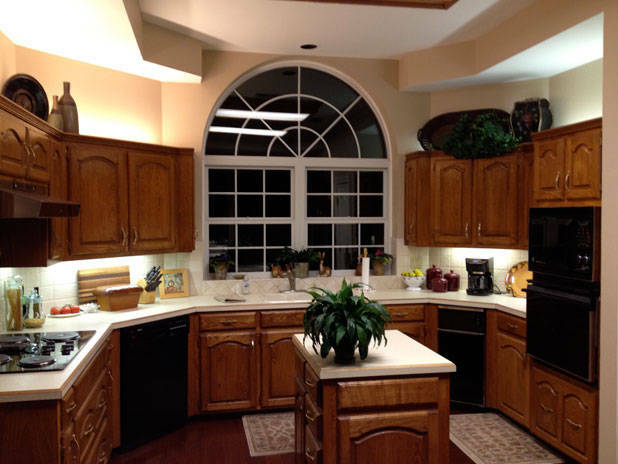 The upper cabinets stayed the same with the exception of new, beautiful pane glass doors. Lightening was also added to illuminate the glassware and highlight the space. The lower cabinets were slightly enlarged to snugly fit the wine fridge. The breakfast nook in our client’s kitchen was a perfect space for the family to gather for meals. The built in window seat had varying heights so Alex rebuilt it to be one long continuous bench with drawers for additional kitchen storage. The wainscoting was also updated from beadboard to shaker style for a clean, modern look. The Hubley Team is so pleased our clients love their new kitchen space. If you are looking to transform your kitchen space, give us a call today. Our clients moved into a beautiful home in Milton. 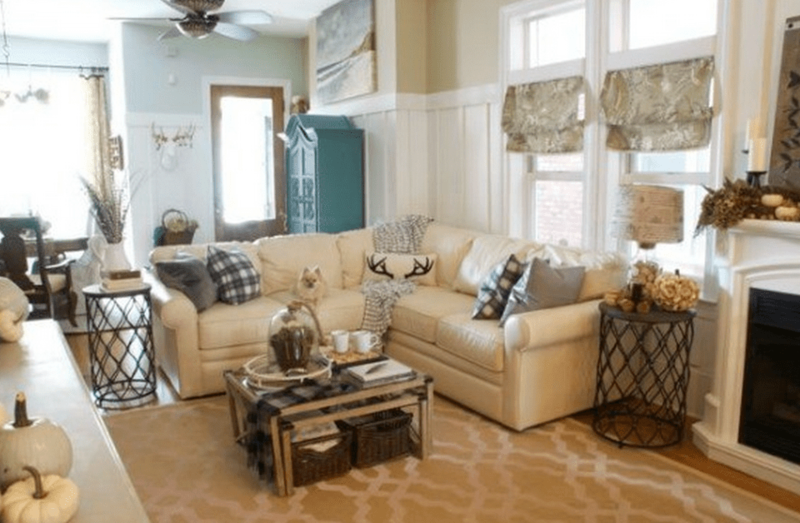 It offered lots of space for entertaining and for their growing family but the house needed updates and some customizations to meet the needs of the homeowners. The Hubley team worked hard to transform this house into the space our clients envisioned. Throughout the house, the floors were given a darker stain. In the foyer, the post at the bottom of the railing was customized for a more contemporary look and a coat of paint was added to the walls to freshen the space. The original kitchen was beautifully designed with lots of storage and prep space but the homeowners wanted it to feel brighter and more open. 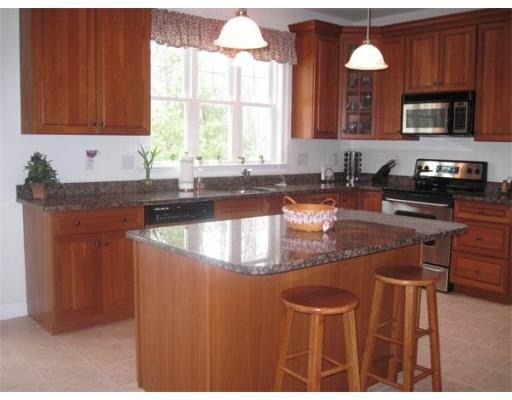 The cabinets were painted and new counters and backsplash were installed to achieve this look. Crown molding was added to the soffits to give the kitchen more stature. The home had a great pantry space but it wasn’t functional for the homeowners. We think the end result is beautiful and offers so much usable storage for this family. 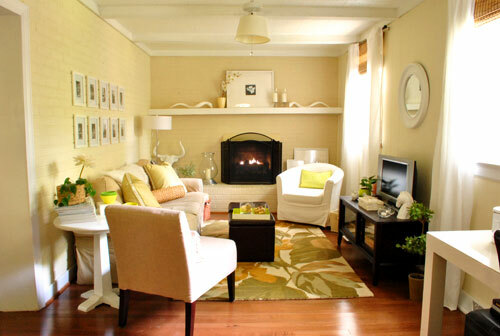 The living room boasts the biggest transformation. Updates to the coiffured ceiling and the built-ins make this space look amazing. 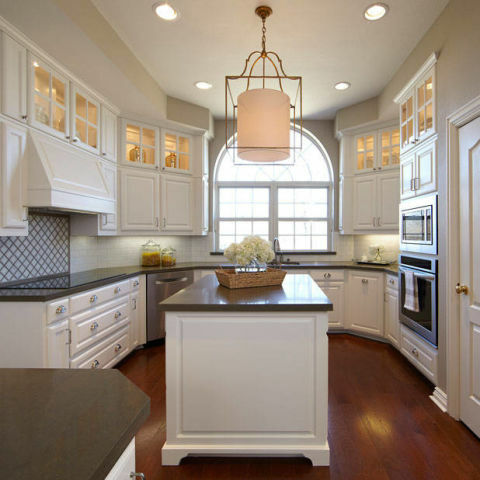 We love how the cabinetry beautifully incorporates the windows. The custom features of this room makes it look grand and more befitting of this home. The third floor was unfinished when the home was purchased. Flooring was put in, drywall hung, baseboards added and railings installed. Built-in cabinetry at one end of the room will be ideal for toys, media equipment or storage depending on how the homeowners choose to use this new space. In the bedroom, our carpenters updated built-ins to make the storage more functional for the homeowners and incorporated the TV into the space for some late night binge watching. Hubley painting can customize your space so it meets the needs of your family and feels more like home. Painting is the best way to transform a space. 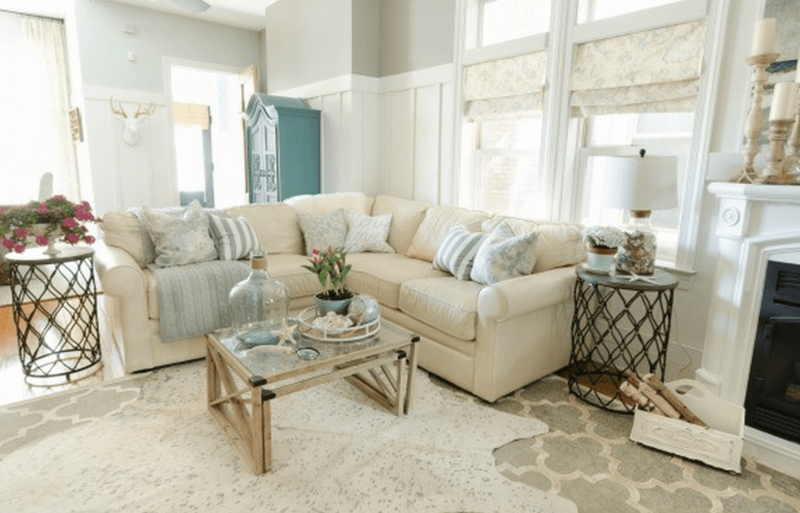 While painting is considered a cosmetic change, a fresh coat of paint can have radical impact and is inexpensive and simple in comparison to renovation. Paint can change the appearance, style and mood of a space. Deep, rich tones give a room depth and character while soft neutrals bring a sense of calm to a space. It is hard to believe this before and after are the same room. 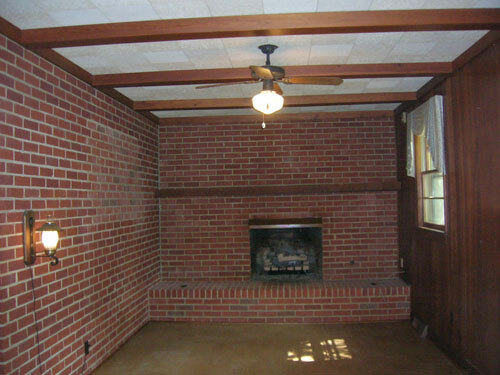 Painting the brick, beams and paneling brought this room from dark and dated to light and bright. The new flooring added warmth. Changes were made to this kitchen before painting to update the space and make it more functional. The island was expanded. Cabinets were repurposed to fit new appliances and a beautiful range hood and new glass cabinets were built to heighten the space. 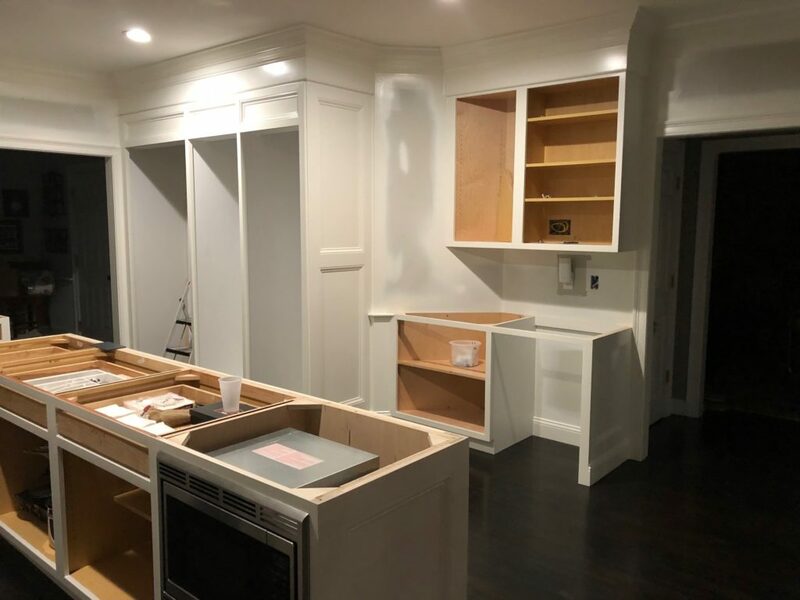 Our skilled carpenter can transform your kitchen space before our cabinet crew does the painting. Household chores become a little easier when you have a bright and happy space to work in. 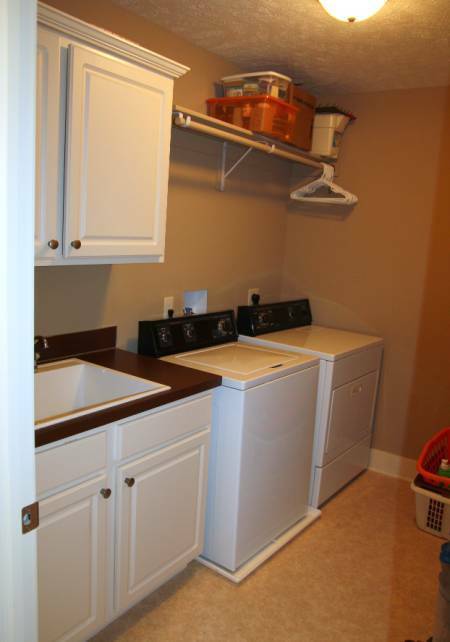 This laundry room makeover simply involved painting the walls, cabinets and changing out the light fixture. 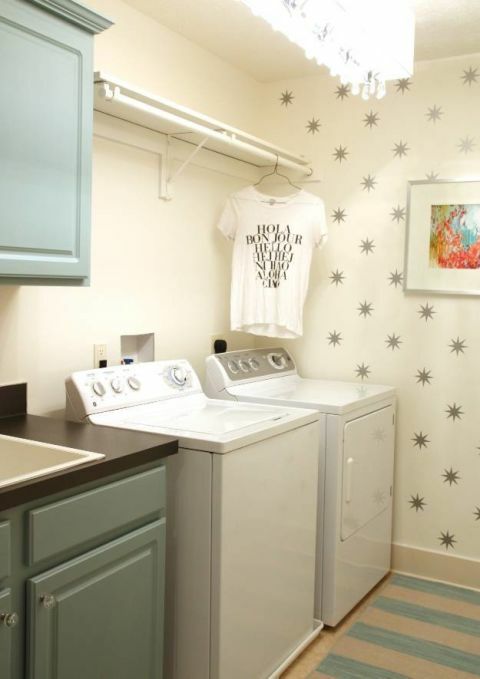 Now it is a space anyone would be happy to do laundry in. This paint transformation is the most striking especially since the color change was not that drastic. Going from a beige to a grey lightened the space. Even the couch and furniture pieces look brighter. Ready to transform your space with paint? Contact us through our website or give us a call to set up a free consultation meeting. We look forward to working with you!